Virtual desktops have been around in various forms since Windows 2000 but Microsoft have never officially integrated them into Windows and so most people will have only ever experienced them from using Linux or MacOS. They allow you to create numerous copies of your desktop including all your application windows and then switch between them at your leisure, helping to organize your work space and letting you easily work with multiple applications. They are particularly useful if you are a graphic designers or software developer or if you just frequently work with a large number of applications and find yourself running out of screen space. 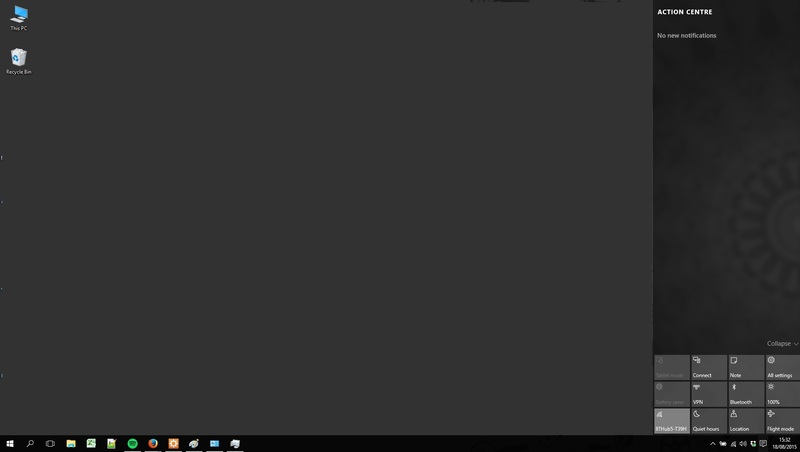 In Windows 10 you can manage your desktops by clicking on the icon in the bottom left corner near the start button. This brings up the screen above where you can click the plus symbol to add a new virtual desktop or choose from one of your existing desktops. You can use the keyboard short-cut CTRL + Windows Key to quickly open up the Virtual Desktops view and the short-cut CTRL + Windows Key + Left/Right can be used to quickly switch between your current desktops. 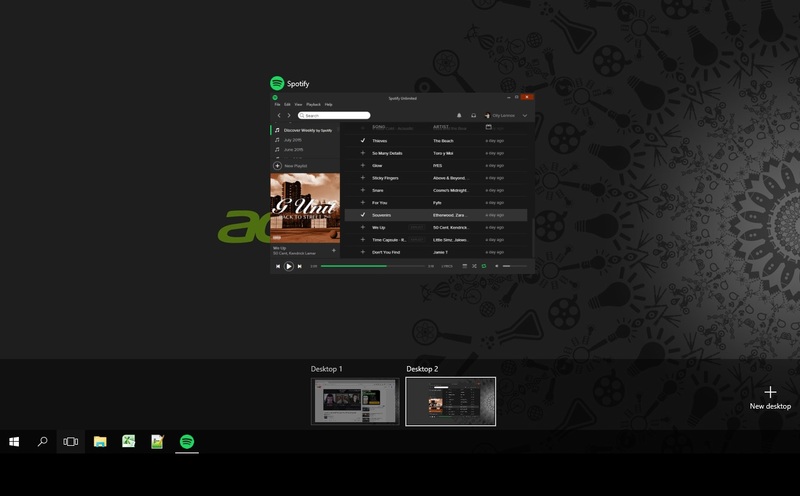 To move an application from one desktop to another simply drag the application window down onto the corresponding desktop portrait on the bar at the bottom. We’re very happy to see Virtual Desktops finally being integrated in the Windows operating system and it finally means an end to all that awkward window shuffling. For those of you who have upgraded from Windows 8 or Windows 8.1 you may already be familiar with the new task manager utility but those of you who are moving from an older version of Windows will be in for a treat. 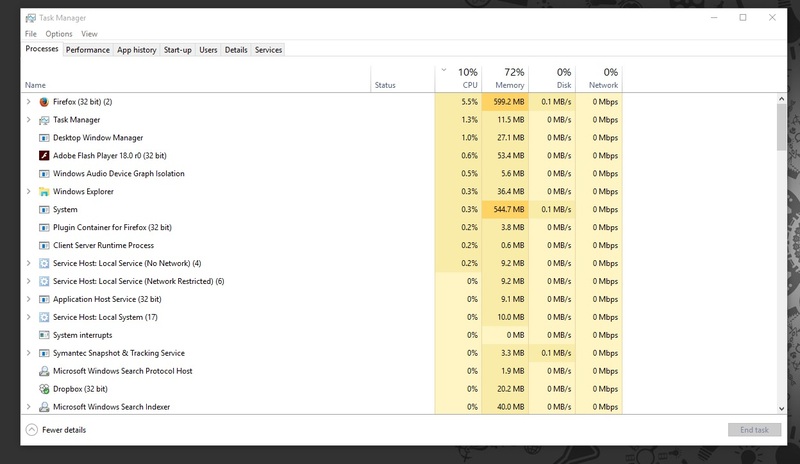 The Windows 10 task manager provides a complete snapshot of your current running applications, processes, services, resource usage and usage history. This huge wealth of information easily allows you to diagnose performance problems and to find unwanted applications that are slowing your computer down The new task manager also lets you manage your start-up applications so you can disable unwanted applications and improve the speed that your computer starts. For power users and administrators you can also manage your system services like you could in previous versions of task manager and the new Users pane allows you to monitor resources in a multi-user setting to see whether certain users are abusing the system. The App History tab can also be useful to diagnose those tricky to solve problems by providing a historical report of application and resource usage. 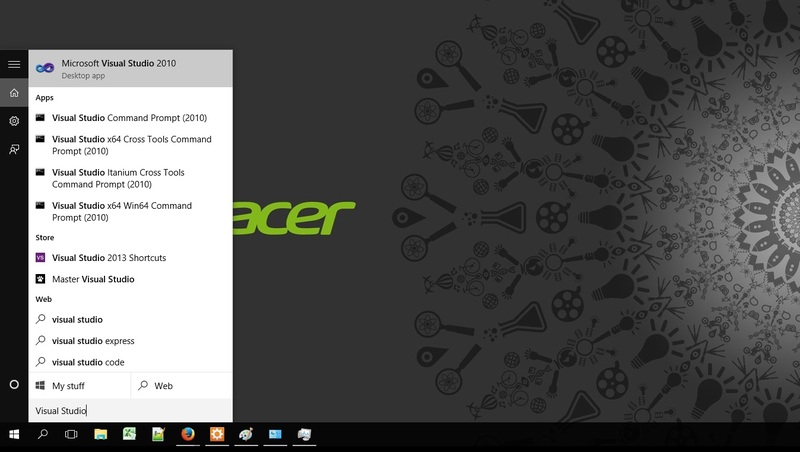 All in all the new Task Manager is a very powerful tool which allows both users and system administrators to manage their computer and applications effectively. The words “Microsoft” and “Search” have never really gone very well together but Windows 10 has built upon the much improved Windows 8 search and the new “Cortana” search utility is by far the best Windows search to date. Simply click on the Magnifying Glass icon or press the Windows Key on your keyboard (and start typing) to start searching. Cortana will automatically search across your installed applications to find a matching program and will also display results from the Windows App store and results from your preferred search engine. Results are nicely broken up into each category with installed applications listed clearly at top. The best result will also be highlighted so if it’s right you can just press the Enter Key on your keyboard to immediately launch the application. If you need to find a document on your computer then click the My Stuff button to search your computer for matching files. The Web search can also be used to jump into a web browser and perform a regular web search using your preferred search engine. In our tests we’ve found that the search results are accurate and typically return what we’re looking for. The application is also very fast and responsive and feels nice to use which is important because this is a feature you will be using a lot. Overall Cortana is not just the best Windows search ever but one of the best implementations of search in an operating system to date so well done Microsoft! It’s hard to talk about Windows these days without the question of the Start Menu being raised. 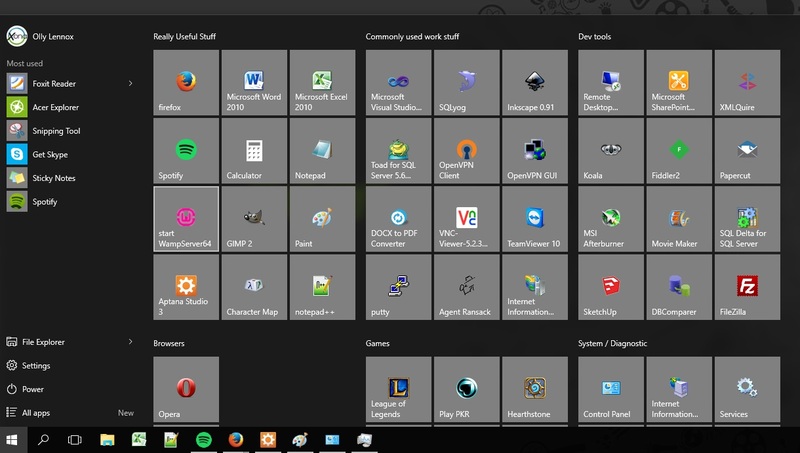 Windows 8 caused major controversy when the Start Menu was scrapped in favour of the Metro Start screen and a large number of customers resolutely stuck to Windows 7 in protest. Windows 10 has listened to the criticisms and many will be glad to hear that the Start Menu has been reinstated with a distinctly Windows 8 twist. The Shutdown options and Frequently used applications have made a welcome return from Windows 7 but Microsoft have scrapped the unwieldy “All Programs” list in favour of the All Apps list and Metro Start tiles from Windows 8. The tiles provide a much cleaner way of organising your applications and the tiles section can be completely customized to fit your own way of working. You can organize multiple tiles into groups making it easier to scan and find the application you want and you can personalize the colour and style of the titles to suit your taste. The active tiles from Windows 8 are also available so if you want a tile to show the latest news headlines or weather updates for your area then head over to the Windows Apps store and take a look at what’s on offer. In our opinion the Windows 10 start menu strikes a perfect balance between old versus new and should hopefully appeal to Windows purists and Windows 8 fans alike. Anyone who owns a Smart Phone (Android, IPhone or Windows Phone) will know how useful a centralized Notification Panel can be. The Windows 10 Notification Panel mimics this functionality by removing all the random pop-up boxes and message windows that used to appear in previous versions of Windows and reroutes them all to a list which you can browse at your leisure. Just click the icon in the bottom right corner to open the notification panel and view the list of current alerts. You can click the small cross icon to clear the notification or click the menu item to get more information or jump to the corresponding application/settings page. Sometimes the most simple features can be the best and we think that grouping all notifications into a single panel makes the whole Windows experience feel much more unified and cohesive than in previous versions of the operating system. The Notification Panel also borrows the “Quick Configuration” buttons from mobile phones which allow you to toggle your computer hardware features such Wifi, Bluetooth and Brightness. We are excited to see how third party applications can leverage the new Notification Panel and don’t be surprised to find this list taking centre stage in the future as it fills up with email messages, Facebook alerts and other rich content.